MahJong Suite 2005 features 2 collections of professional and exciting MahJong Solitaire Game in one! For MahJong lovers, MahJong Suite is a guaranteed pleasure. Each of the MahJong Solitaire Game is fun and exciting and will keep you entertained for hours. If you like MahJong Solitaire Games, then you'll want to add MahJong Suite to your collection ! Play Mahjong Solitaire Games! - Play traditional MahJong-type games with classical MahJong tile sets and millions of possible combinations! Play Matching Games! - Play matching-type games with funny tile sets. Very Beautiful Additional Tile Sets. - Buy MahJong Suite 2005 and you'll get MahJong Suite Graphics Pack for free! MahJong Suite Graphics Pack contains a collection of very beautiful Tile Sets and backgrounds to use with MahJong Suite 2005. Unique Scoring System and Statistics. - Enter Hi-Scores and manage your Statistics. Play to reach the Hi-Score for every layout and manage games won, with 3D Graphics. Play MahJong Suite 2005 with the Entire Family or Friends. - Create an unlimited number of Players so that you can challenge your friends to beat one another's Hi-Scores, Games won, Score Statistics. Several Tile Sets to Choose From. 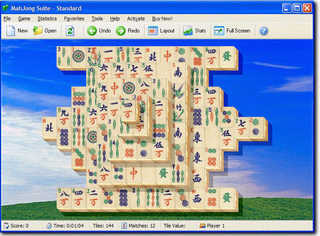 - MahJong Suite 2005 includes several tile sets from traditional MahJong Solitaire Game tile sets to fun-matching types. Click here to see all the tile sets included. Millions of possible games to play for each MahJong game! Electra Gmae - Everybody wants to be a superhero: but some of us have to be electricians ! Word Emperor - A ncompelling Crossword Puzzle Maker to make a crossword Puzzle for you that is both challenging and fun with game play ! Mahjong Holidays II - It's time to ring in the holidays with Mahjong Holidays II. new Super mahjong Tile Game. Mah Jong Medley - Now you have 4 exciting ways to play Mah Jong Solitaire. Get your free Mah Jong tiles trial now !